» Reviewed by Barry Gardner: JOHN ANGUS – The Monster Squad. Reviewed by Barry Gardner: JOHN ANGUS – The Monster Squad. JOHN ANGUS – The Monster Squad. Cat O’Neil #1. St. Martin’s Press, hardcover, 1994. No paperback edition. Angus was born in Germany, has been a bartender and a security guard, and now is a computer programmer. Interesting background. This is his first novel. After her time on the mean streets of L.A. she’s no shrinking violet, and that’s just as well — the group she’s supervising gives new meaning to the words “crude,” “vulgar,” “sexist,” and “tough.” Not long after she’s begun to try to whip them into some sort of shape, one of her crew is found murdered in his squad car, and links with him and a prostitution ring surface, Maybe L.A. Vice wasn’t so bad after all. Well, this was different. O’Neil is tough as a frozen corn cob and obscenities peg out around 1,000 on the nasty-talk scale. It’s not really a very nice book at all, dealing as it does with teenage prostitution and various other unsavory subjects. I’d call it macho is the lead weren’t female; macha, maybe? It’s well-written from a prose/packing standpoint, though there’s no lyrical prose (unless the f-, s-, p-, c-, etc. words strike you as lyrical, in which case it’s a whole songbook) and no characterization of any depth beyond O’Neil herself. Despite the fact of the lead being a strong female character, I can’t see this appealing much to women — but then, I’ve been wrong a few thousand times before about what women like. 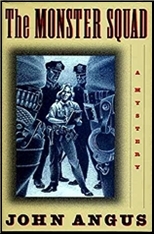 Bibliographic Update: This was the only book in the series, and in fact, John Angus’s single work of crime fiction. SHE’S THE SHERIFF meets Joe Waumbaugh.